Last time, we talked about a writer who never had to sell her writing or do other labor in order to live. One wouldn't dream of criticizing Emily Dickinson - except her gingerbread recipe, which makes gingerbread as dense as a brick - but it's worth pointing out that she never had to compromise her artistic vision so that she could eat. Louisa May Alcott's family, by contrast, lived off of Louisa's writing. Jo March, therefore, couldn't follow the pattern of her creator and remain independent; readers demanded that she get married, so she got married. 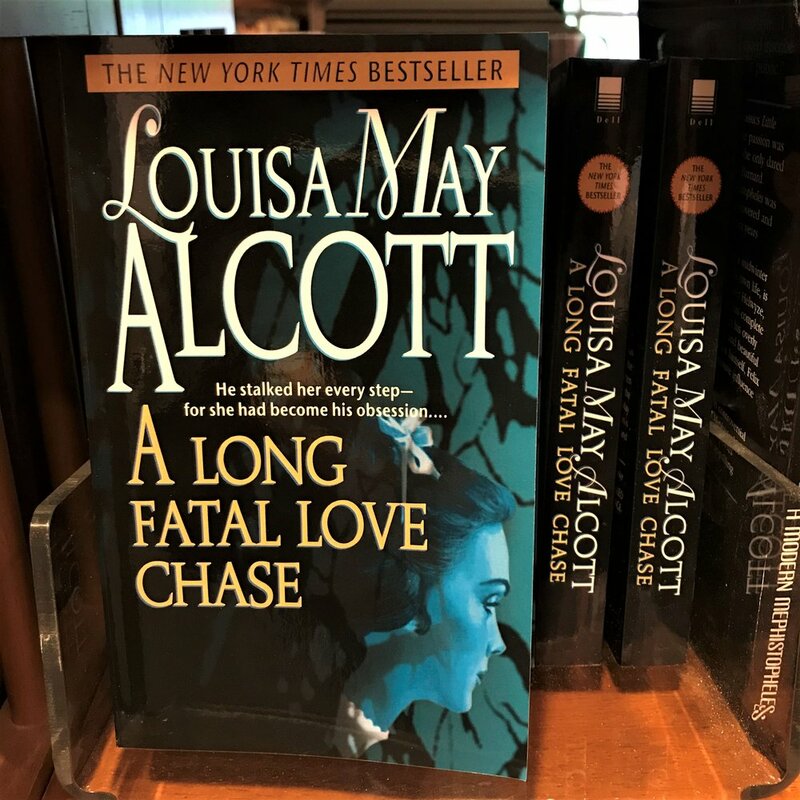 For those who have always wondered why she didn't marry Laurie, which is everyone, here is a possible answer to your question: because Louisa May Alcott hates you for thinking Jo should have married at all. Mr. Behr is your punishment. If Alcott had been alive when Twitter was invented she would've originated #sorrynotsorry. I did a double-taken when I saw this. "What is that romance novel doing in the Orchard House gift shop?" I asked myself. You have to admit, the title A Long Fatal Love Chase begs for this cover. Personally, I can't wait to read it. The Picnicker and I visited Orchard House on a gloomy, cold day in late May. It feels rural, still surrounded by woods and fields. Nathanial Hawthorne's house is about five hundred feet down the road, and Ralph Waldo Emerson's house is close by, too. For anyone who paid any attention to the Transcendentalist unit in social studies or English class, it's a surreal place to visit. I've been to lots of famous literary and historical places, but there's something about the high volume of famous thinkers in such a tiny geographical area at the very same time that's a little overwhelming. Orchard House was the only one we could handle. Louisa May Alcott's father, Bronson, was a teacher. Unfortunately, he encouraged his students to question authority and think for themselves, so he kept losing his schools. And his homes. That's why the family ended up in Concord - because Emerson essentially bankrolled the entire Transcendentalist movement. I exaggerate, but not that much; there's an essay in Susan Cheever's American Bloomsbury called "Emerson Pays for Everything." 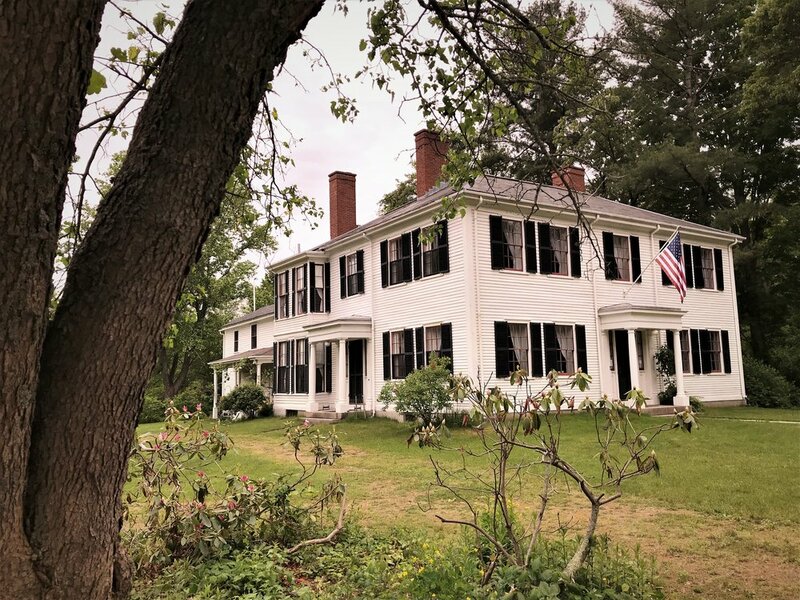 Emerson also made it possible for Hawthorne to get married and move to Concord, and even sent Thoreau to go and plant vegetable and flower gardens to make him welcome. I imagine Emerson kind of like the Don of Concord. 80% of the more scandalous facts in this post are from Susan Cheever's American Bloomsbury, which I reread parts of in order to add some flavor. I cannot recommend it highly enough. It reads like a novel, is hilarious, and brings out the undignified humanity of all these Great Figures, which is my favorite part of Great Figures. Here's Emerson's house on the left, and Hawthorne's house on the right. Bronson Alcott was so unreliable in terms of bringing in money that the family referred to their bank balance as "the Alcott Sinking Fund." Margaret Fuller called him Plato Skimpole, which is the most on-point insult I've ever heard - Skimpole being the disingenuous character from Bleak House who lives off of the wealthy Mr. Jarndyce, claiming that he is simply too innocent and childlike to take any responsibility for himself whatsoever. Whether or not Bronson Alcott really was that bad, it was Louisa who had the discipline and ability to support her family. After going to the Dickinson House the day before, and having been to the Susan B. Anthony house in the spring, it was especially striking that the main thing all these women had in common were parents - especially fathers - who believed in education for boys and girls, and that it wasn't necessarily the sole purpose of women to marry. One wonders what ideas and stories and art other women of the time had inside them, but were never able to express. I've always been a bit upset about the decline of the library of Alexandria, and about the Cotton Library at Ashburnham house going up in flames. But when I think of how half the brainpower of the human population was actively sabotaged (or at best ignored) until, well, let's generously say a hundred years ago . . . the intellectual loss is so staggering it's incomprehensible. I got depressed and abandoned the writing of this post for two months, that's how staggering it is. 1. Louisa's sister Elizabeth (a.k.a. Beth in Little Women) never lived at Orchard House. 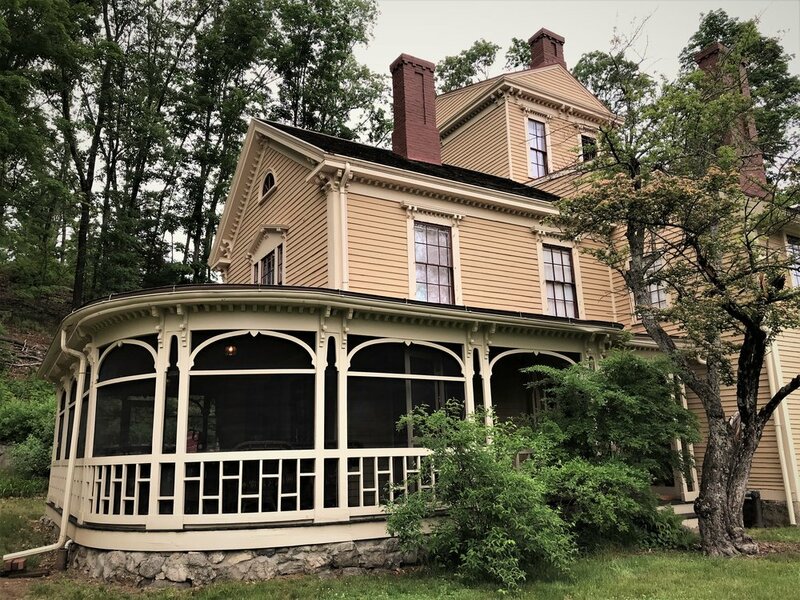 The Alcotts were renting a different house in Concord in early 1858, waiting for renovations to be finished, and Elizabeth died of scarlet fever before they moved in. She was 22. Louisa herself was 25, so her childhood was over by the time her family moved into their iconic home. The Alcotts moved about a million times during her youth, so it was her first stable home. 2. Louisa was moody, apparently. I can never tell, when women's emotions are described historically, whether they were really overly emotional or whether they had just decided not to conform. Either way, Louisa had this "mood pillow," a cylindrical pillow that was upright when she was in a good mood and flat on the sofa when she was in a bad mood. I didn't think to ask at the time whether it was Louisa who changed the pillow or whether it was the family who moved it, to serve as an early warning system for others. Either way, one has to admire a woman who, in the 1850s and 60s, insisted on the importance of her feelings. 3. Related: One of my notes from the tour is this: "Louisa had to give up her own piece of cake at her birthday party and did not feel morally fulfilled by the sacrifice." I believe this was mentioned to illustrate her general bad temper but I've got to side with her on this one. Birthday girl gets cake, no exceptions. 4. Louisa truly believed Little Women was no good when she wrote it. "What a joke," she said of it. Later, when she was absurdly famous, she would sometimes have to escape fans who came to the house by pretending to be her own maid. 5. May (a.k.a. Amy) drew on many of the walls in the house, and all over her bedroom. She became an artist, but was criticized for her lack of knowledge of human anatomy. But where, one might ask, could a woman take a life drawing class before, like, 1975? Anyway, one of her students was Henry Bacon, who designed the Lincoln Memorial. Obviously Henry Bacon didn't understand anatomy either, for Lincoln wasn't nineteen feet tall in a sitting position. He was only nineteen feet tall when he stood, everyone knows that. We weren't allowed to take photos in the house, so you'll have to go yourself to see it. Be warned that it will give you strange feelings of nostalgia for a place you've never actually been. Also, in the gift shop, you may find a copy of the "Order of In-door Duties for Children" that has been hanging above the toaster in your grandmother's house ever since you can remember and suddenly so many things make sense that you never put together before and it's all quite surreal. 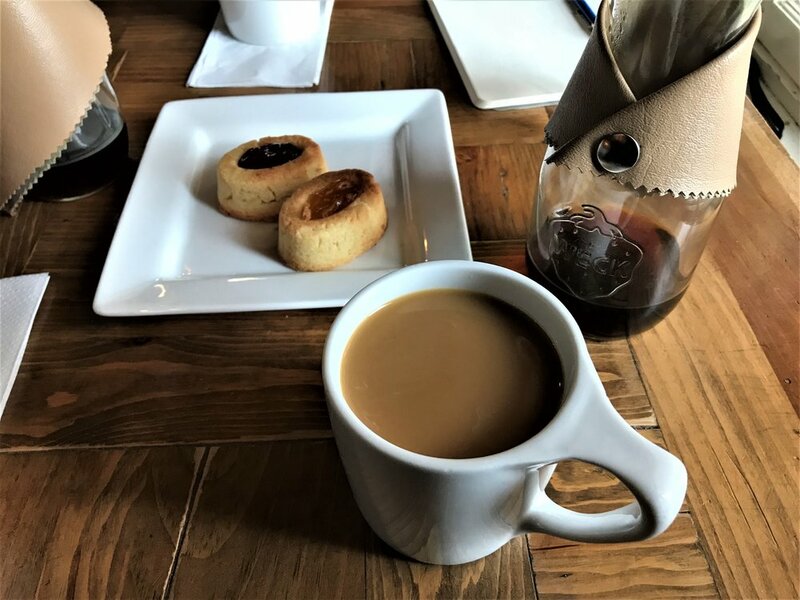 As I mentioned, it was a freezing cold day - rainy and gusty - so the Picnicker and I took refuge in a funny little coffee shop called Haute Coffee that served funny little coffees in funny little bottles with funny little capes. A-dor-a-bul. The Picnicker sketched while I rested my brain after the onslaught of nostalgia (it can be so wearying) and somehow the funny little capes made us feel very sophistiqué. Sophistiquée? Sophistiquées? We were sophisticated but no better at subject-verb agreement than before. Every day of sightseeing should end like this. Susan Cheever's American Bloomsbury: Louisa May Alcott, Ralph Waldo Emerson, Margaret Fuller, Nathaniel Hawthorne, and Henry David Thoreau - Their Lives, Their Loves, Their Work, was published by Simon & Schuster in 2007. It is my favorite nonfiction book after everything Richard Holmes ever wrote, and that's saying something. Dec 4 Angels can do no more!